Prompted by the rising water cost and irrigation restrictions, San Diego homeowners consult the many resources available the Water Conservation Garden in El Cajon (at www.thegarden.org ). 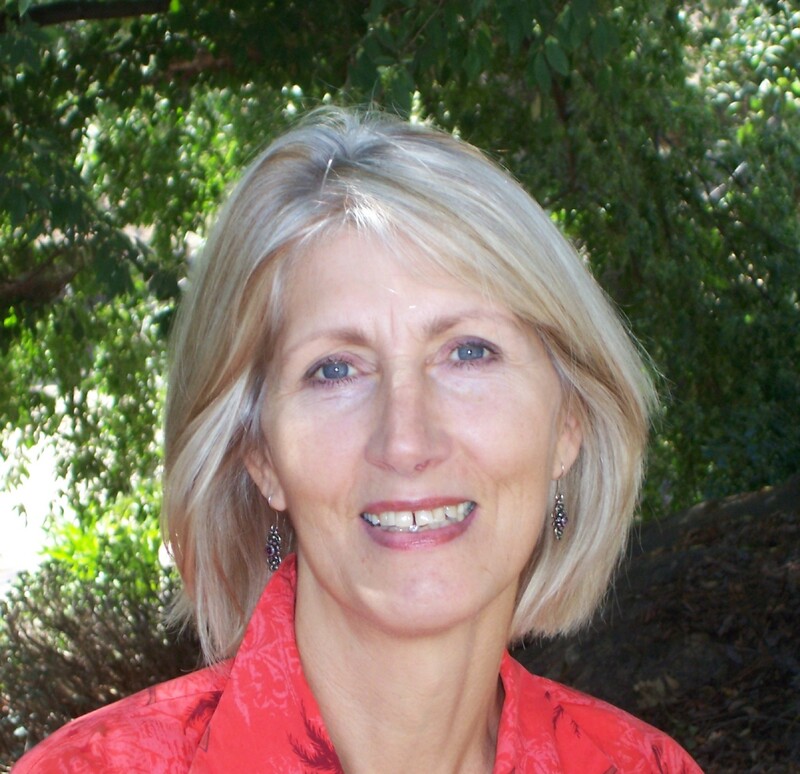 Among these resources are landscape design and horticulture experts offering consultations on subjects like “California Friendly Plants”, watering, arboriculture (the science concerned with trees), construction issues and landscape design. I enjoy being one of those professionals, and I thought you might be curious to learn how such a consultation might work for the people that come there. In my consultations I generally encounter the same objective: Feeling the need to reduce their water bill or wanting a landscape that is more practical and ecological, these homeowners are ready to retire their mostly lawn-centered landscape. They come to the Water Conservation Garden with the common question, “What do I plant now?” Most of them believe that planting the right plants would make their gardens better and solve their problems; isn’t that what the beautiful low-water-use plants at “The Garden” are all about? I understand this thinking but, as designer and horticulturist, I don’t think that suggesting different, albeit drought resistant, water-wise or “xeric” plants, would address the underlying problem (although those plants are generally more sustainable). I feel that planting random groups of plants into the former lawn area would not create attractive, comfortable spaces for outdoor living that “work”. Since that is my focus, I explain to the visitors that it would serve them best if they considered first how to make enjoyable outdoor living possible, in separate spaces designed for different uses. What needs to happen in a yard so it can become an “outdoor living room”? How do you convert it into a play room, or entertainment space, a space to hang out, relax, dream, rejuvenate? This family, husband, wife and son, arrived well prepared for the consultation, with photos and a sketch of their garden drawn to scale. They had decided to take out most of the lawn, a large expanse right by the patio; they would only keep a small part of it for their son for whom lawn mowing is a therapeutic activity. Opposite the patio, far across the lawn, was a planter bed, but since it was so far away and confined also by a low wall, the flowers in it were not recognizable from the patio. To my surprise, the lady told me that it held roses! Her husband mentioned, almost in passing, that he would like to grow succulents. Some trees were there, but they had been planted around the louter perimeter of the lawn so that they couldn’t throw any shade where it mattered most, which was on their hot south-west facing patio. “Hardscaping” elements such as patios, walk ways, fencing, arbors, boulders – convey permanence and add structure. Most of them don’t have to be maintained, except for some new coat of paint or occasional sweeping, depending on the material used. And they don’t demand watering, fertilization, pruning… So I suggest to incorporate them as much as possible into a design and let them “furnish” the garden, organize the space into areas of different use, provide separation as well as access, focal points, delineation and definition. In the case of the before mentioned visitors, we found that a swing for adults, placed under a shade tree, would be lovely to have; I suggested to place it at the far end of the garden from where the family could see house and patio from a new perspective, and I drew its outlines on transparent paper taped over their sketch. And why not pull rose bed and succulents closer to the patio from where they could be seen? Of course not into one flower bed, but in different areas that are perhaps even mounded up, separated by a walk way: Gently curved mounds give movement to an otherwise flat plan, and the plants on them can be seen better, like on a painted canvas. 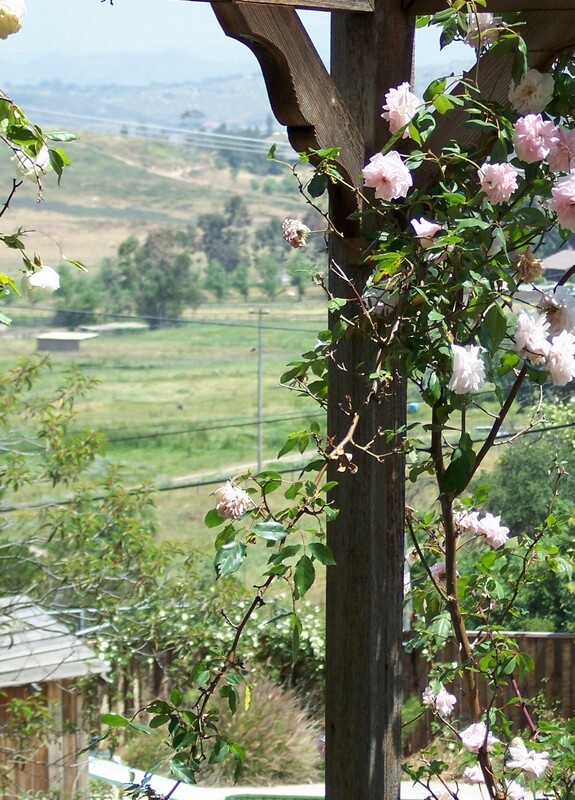 And if your soil drains poorly, creating those mounds helps improve the drainage because you can mix the mounded soil to provide the drainage your plants need, such as many Mediterranean plants, California Natives and succulents, and even roses. As for the lawn, we drew a much reduced kidney-shaped area that started at one end of the patio, wrapped around behind the rose bed and the succulent mound, and ended at the other end of the patio. This way it was still visible and easy to get to from the patio without dominating the foreground. And to make all the different areas accessible, we discussed stepping stones and DG as possible material for the walkways, even coarse landscape mulch was considered. Lastly we reviewed the possible locations of trees, and I pointed to my most favorite reference books on this subject: Ornamental Trees for a Mediterranean Climate, the trees of San Diego, by Steve Brigham with book design and photographs by Don Walker, and the Sunset Western Garden Book. Here gardeners can research all their favorite choices before making the final selection; they can actually visit the trees shown in the tree book at their location! Our time was up, and although we had not talked much about plants in detail, the family was happy (I suggested to look to the Water Conservation Garden’s displays for ideas). Both husband and wife had information and tools in their hands that will make “playing” with their spaces, on paper first, a fun and exciting activity; selecting goals that are realistic and achievable with their budget and energy will now be a manageable task. 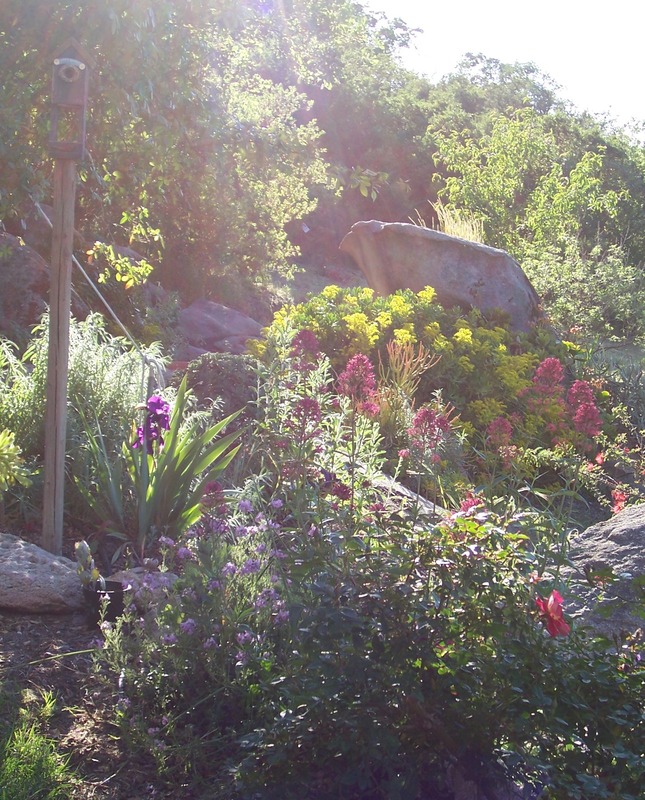 And finally, armed with the proper reference books and resources that the Water Conservation Garden and other public gardens in San Diego County offer, they will be on their way to a garden that they can enjoy, and live in. At the heart of my considerations for this container display was my desire to create a composition of beautiful yet tough plants that would delight their owners for a long time without being too fussy or difficult to replicate. They would need to tolerate exposure to drying winds, intense sun, month-long temperatures in the upper nineties or low hundreds and occasional light frost, periodic neglect (and no watering), and a lot of competition for space, both above the soil level as well as for the roots. And they would have to like living in my hypertufa troughs (see my previous post), at least for the next 2 or even 4 seasons, to be “sustainable” (at least as far as a container-existence is concerned). 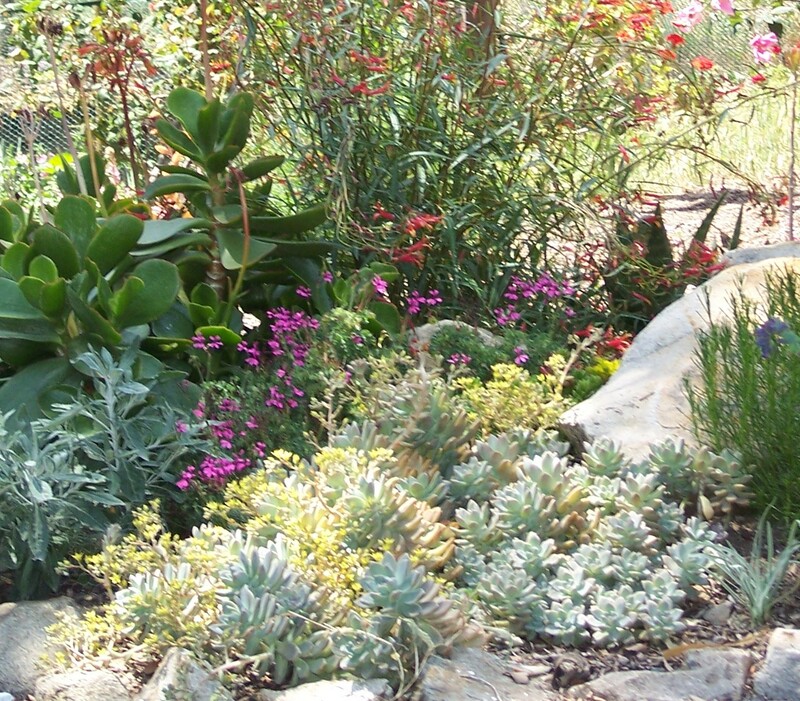 I already had a few suitable plants: Leucadendron discolor, Aeonium Sunburst, Firecracker Broom, Crown of Thorns, String of Pearls… These are all drought tolerant shrubs, perennials and succulents whose adaptation to prolonged container life on my deck in Ramona I had been admiring for a couple of years. I only needed to find complementary plants that would offset or enhance their qualities and allow me to juxtapose textures, forms and colors. Although my intended “pièce de résistance”, the Leucadendron discolor, had clearly proved that it can survive a container-existence (mine is now some 6 ft tall and 3 years old) it was too big for my trough. 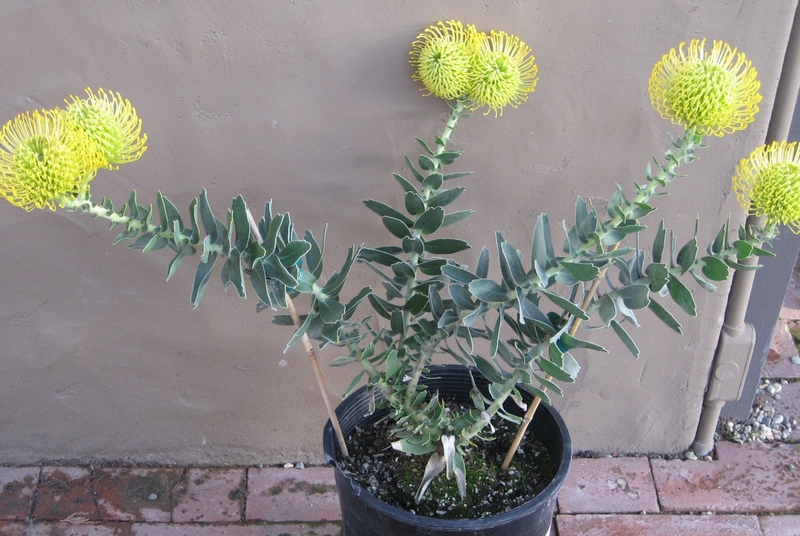 I chose instead a close relative, the Pincushion Yellow Bird, Leucospermum cordifolia ‘Yellow Bird’ that drew lots of admiring comments at the fair. This beautiful South African shrub is related to Proteas and reminds me of the flowers of thistles – without the bristles. Sunset gives the growing zones as 15-17, H1 and 21-24. It grows to 4 ft tall and wide and can take several degrees of frost; the side buds will produce flowers even if the main flower buds freeze. The nodding Pincushion is the best species for cut flowers with blossom clusters that are about 4 inches across, borne at the branch tips. The bloom peaks in late winter or early spring and can last for 6 months but can start earlier in mild winters. It is supposedly difficult to grow because it needs perfect drainage, protection from drying winds but good air circulation. It requires full sun, regular water only in the beginning until establishment (several months to a year depending on planting season) when it needs water only every 2 to 4 weeks. Selections of this plant in other colors include ‘Flame Spike’ (salmon red) and ‘Red’ (orange red). Because of the Yellow Bird’s gawky and gangly form I decided to place a “counter weight” next to it, and the appropriate one had to be the Sunburst Aeonium. 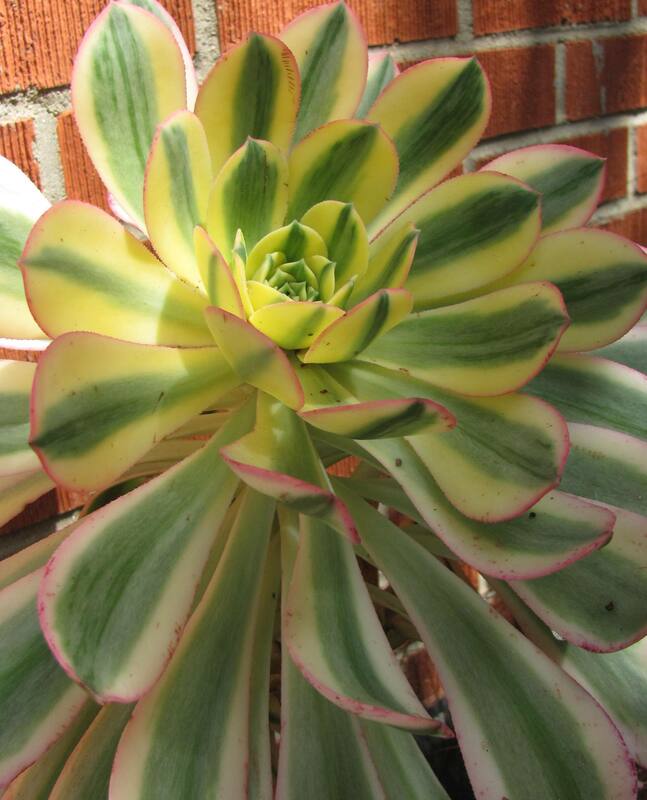 This succulent grows leaf rosettes at the branch tips that reach a foot across, to form plants that can be about 2 ft across and of about the same height. The fleshy leaves have a delightful variegation that makes the plant very attractive. It blooms after several years only and will then die, but the new “pups” or side shoots will replace the mother plant. With age, these plants become leggy but you can keep them bushy and encourage branching by cutting back branches several inches below rosettes. These cuttings can then be used for easy propagation: let them dry for a couple of days, then set in sandy soil kept barely moist until new grow emerges. With its low watering requirements and equal sun tolerance it will make a good companion to the Yellow Bird. In the rear container one you can see the red and purple companions: Crown of Thorns, Coral Fountain (also called Firecracker Broom), Geranium ‘Vancouver Sentenniel’ and Statice. 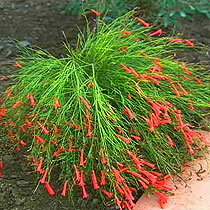 The Firecracker Broom, also aptly called Coral Fountain, is a good container plant: Here it keeps a much neater and smaller form than in the ground where it can reach to 5 ft high and wide; if the green, almost leafless stems of my container get too long they are easily shortened without loosing the graceful drooping form. On my deck in Ramona it has continuously produced a profusion of bright red, narrowly tubular flowers since last year that attract hummingbirds. This shrub needs regular but small applications of fertilizer to keep blooming. It tolerates partial shade or bright indirect light and needs only moderate to regular watering. 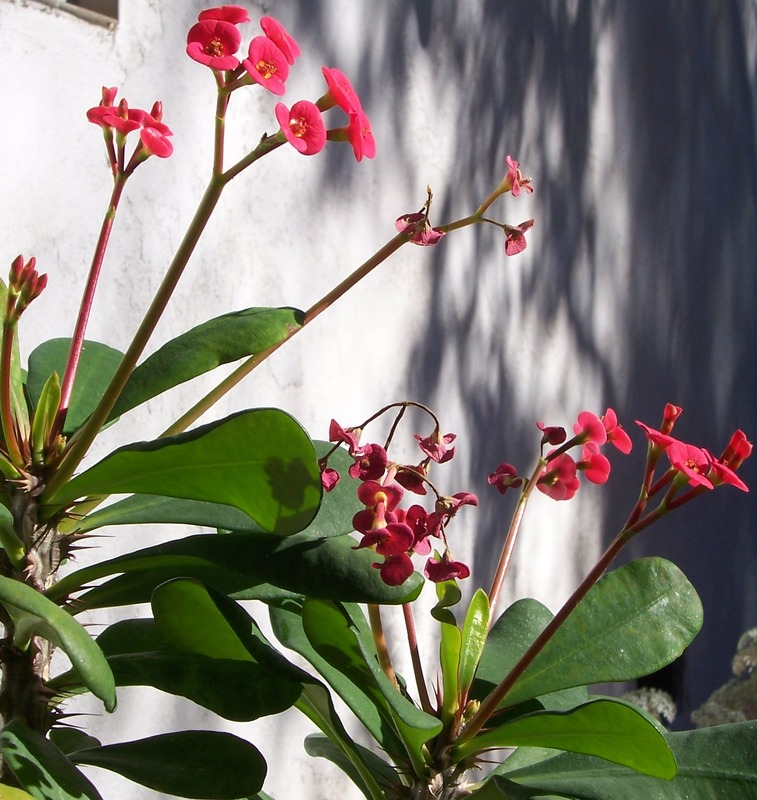 Next to it, producing an attractive contrast with its sturdy, upright form I planted Crown of Thorns Euphorbia milii. It, too, hasn’t stopped flowering since I planted it in the previous container about 2 years ago. It doesn’t seem to mind that I uprooted it from its previous home… It’s a bit thorny but can be handled easily with leather gloves that will protect your hands also from the milky sap that can cause skin rashes and is toxic if ingested. It also requires excellent drainage and has very low water demands. It grows 1 to 4 ft high and about 1 ½ ft wide which makes it an excellent upright narrow accent in a container. Many varieties and hybrids of this one exist in colors of yellow, pink and orange. In windy or frost-prone area it is best grown against a sheltered wall. Salt tolerance makes it ideal for seaside plantings! 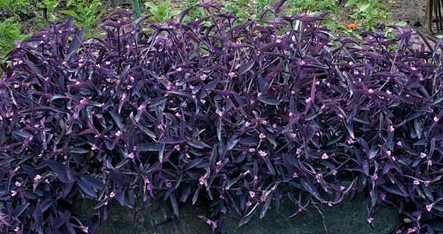 It tolerates partial shade or full sun, and as indoor plant it needs bright light. 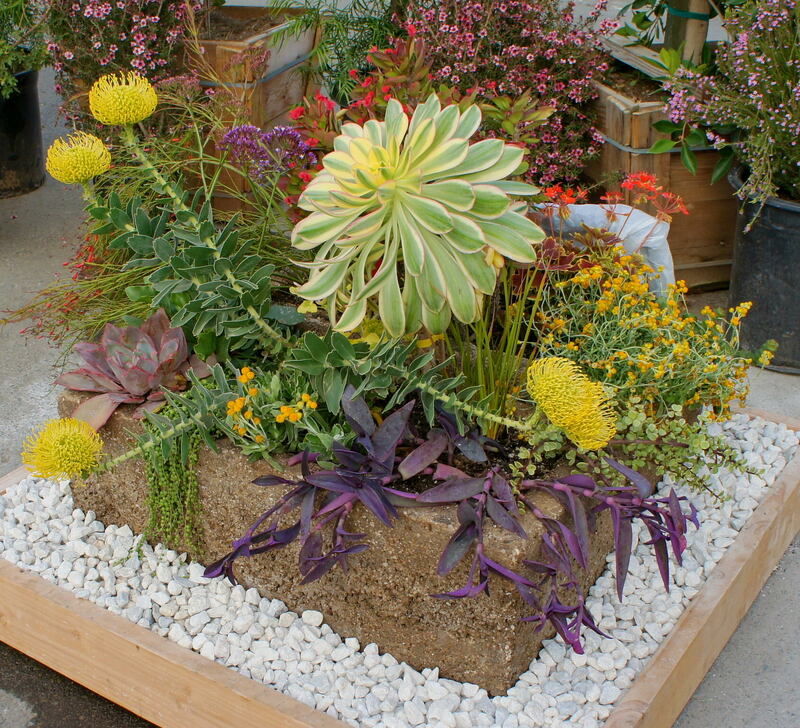 All these plants are set into a fast-draining succulent soil mix. The two troughs, displayed at the fair back to back, are now back at my house and adorn my front door and my deck. I doubt that I will need to keep an eye on them for the last days of “winter” and a possible frost. And for next winter I’ll keep an old bed sheet handy in case a strong frost is in the forecast. From now on my main concern will be not to overwater, and to not forget to feed the plants occasionally, and to keep the ants from raising a colony of aphids on them. And if you need sources and would like to share your own container-stories with me, please let me know! When I got home last night in the rain, I took in the air in deep breaths: Such a wonderful smell of wet soil and decaying leaves mixed with something sweet and flowery – where was this powerful scent coming from? So I put on my boots, took a flash light and went into the garden. 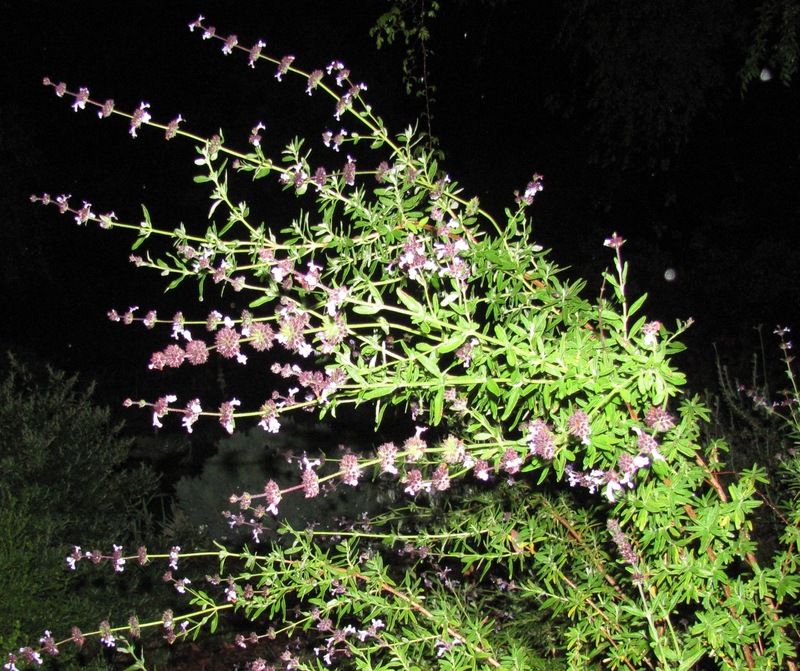 I got my face wet as I poked my nose into foliage and flowers of shrubs, perennials and succulents, and not far from my front door I found the first: A grouping of Cleveland Sages Salvia clevelandii that had just opened their buds. 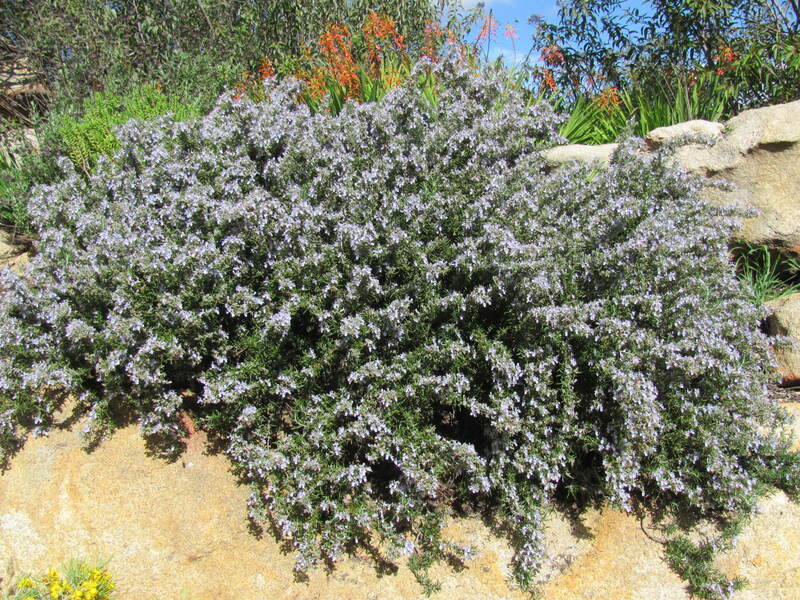 These California natives are known for their incredible fragrance, and for those who have never seen or smelled any, the description alone should make your mouth water: This is an evergreen shrub of the mint family with a refined, rounded and arching form, to 3 to 5 ft tall and wide and wider for some cultivars. 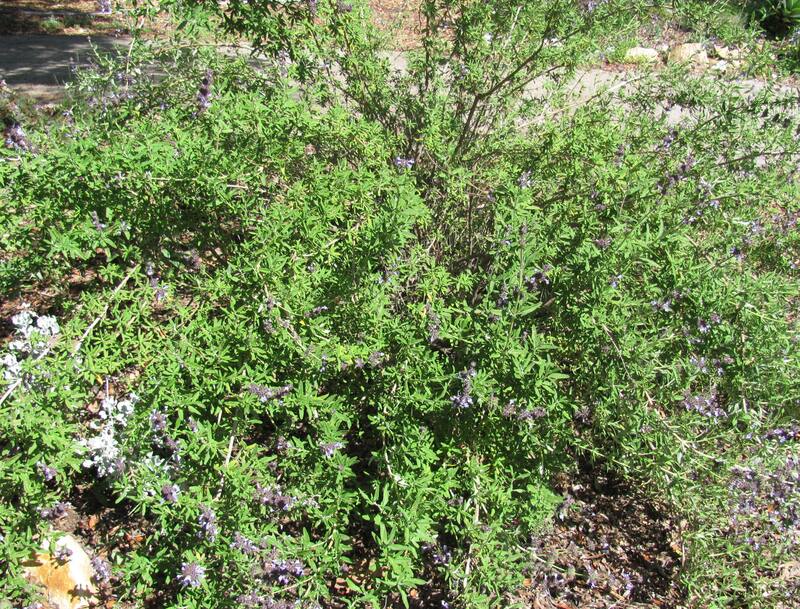 It has wrinkled, toothed gray-green or dark green leaves that can be used in teas or as substitute for culinary sage and that are deliciously fragrant; a breeze blowing through your garden will take the sweet fragrance far. The flowers are an inch-long, pale lavender or violet-blue, arranged in whorls along the stems, and they are also fragrant. To encourage re-bloom you will need to cut back these flower spikes back, but the shrub is also attractive with its dried flower spikes. This plant is so popular that several hybrids have been created: Mine is the ‘Allen Chickering’ which gets to 4 ft tall but spreads out to about 6 ft and sports pale purple flowers. 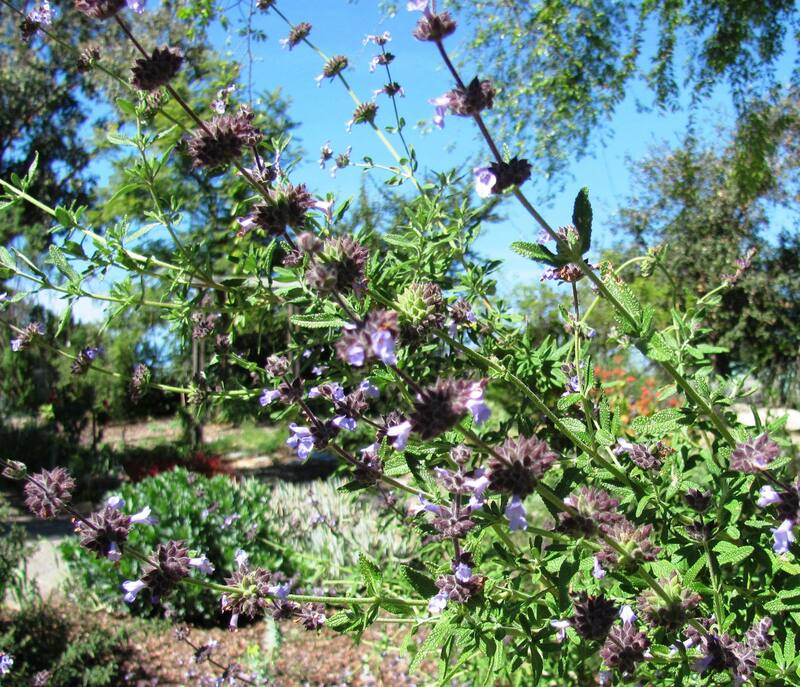 Check out also ‘Winifred Gilman’ with lavender-blue-purple flowers, or ‘Aromas’ with gray-green foliage and deep lavender flowers, ’Pozo Blue’ that is hardier than Alan Chickering’ (to 10 degrees F). The Cleveland sages need sun (partial sun only in the hottest, driest regions), fast-draining soil, and are drought tolerant although they can tolerate occasional watering. There are differences in their cold tolerances that could be important for your location; please check with the growers below for the appropriate one. A little deeper in my garden the beam of my flashlight hit a tall lanky shrub whose buds were just opening, and I know it carries its name Mountain Lilac for a good reason: The flowers look like miniature Lilac clusters, and to me even their smell reminds me of true Lilac. Mine is the hybrid ‘Ray Hartman’ which is the best known and most commonly grown of the bigger ceanothus hybrids that can reach 18 feet in height and width; its rose-colored buds open to display profuse clusters of sky blue flowers. 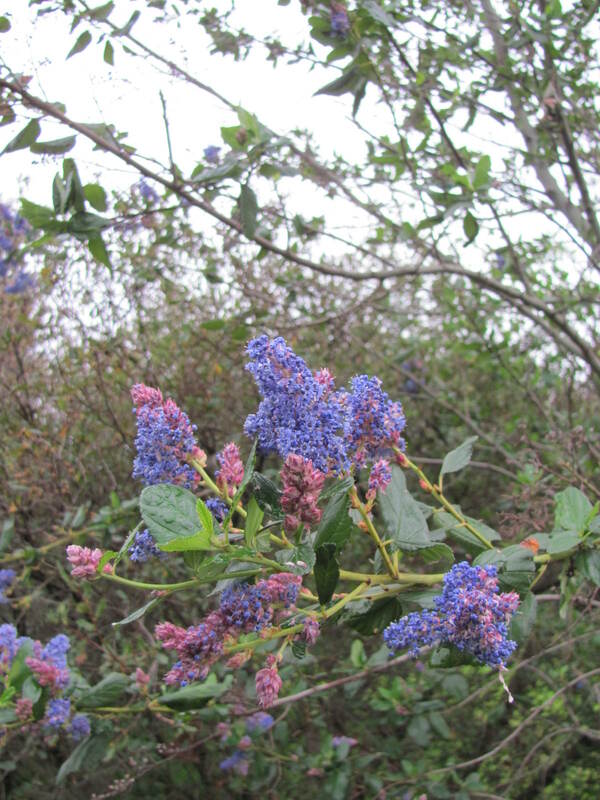 California’s Mediterranean climate supports 60 species and varieties of ceanothus, and the choices can be confusing. They grow in some of California’s harshest habitats, ranging from wind-buffeted coastal headlands to dry, exposed slopes at the edge of the Mojave Desert. They come in various forms, from creeping to large shrubs and small trees, and their colors range from bluish whites and pale purples to deep Gentian blue and purple. Most grow in areas that experience an extended summer drought; they tolerate a range of soil types but often are located on steep slopes in well-drained soils of low or marginal fertility. Most then require excellent drainage, but some can also tolerate heavy soil and summer water. Ceanothus have become popular shrubs in Europe, where cultivation of ceanothus species for horticultural purposes began as early as 1713! Check with one of the growers mentioned below for the species that will perform best in your garden so that its growing conditions match or approach those found in its provenance. 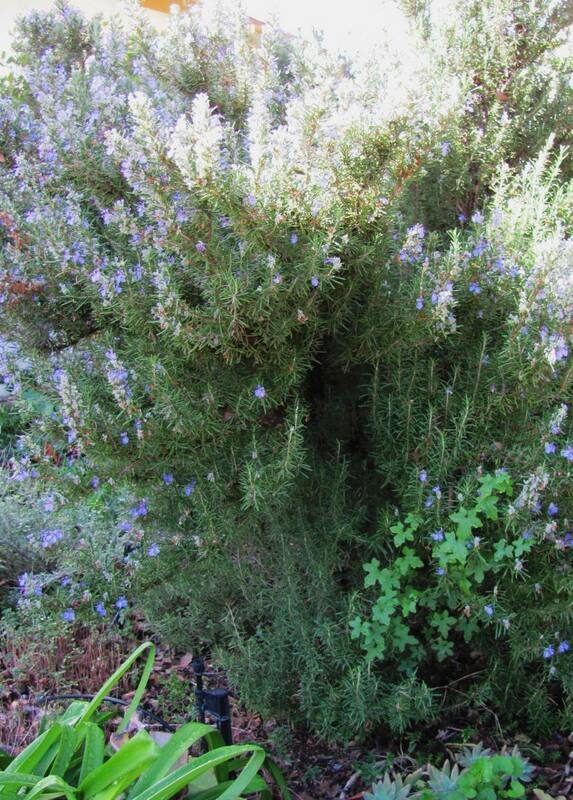 Not far from my backdoor (and closer to the kitchen) I found Rosemary, a true Mediterranean whose name means “dew of the sea”, reminding us of the plant’s native habitat on seaside cliffs in the Mediterranean region. This winter bloomer is not quite as fragrant as my sages but also definitely desirable. The evergreen shrub is covered with narrow, resinous dark green leaves, and through winter and spring its fragrant pale blue to deep violet flowers are a magnet for bees and small birds looking for tiny spiders and insects in the tightly packed flowers (and perhaps also eat the petals). I love the ‘official’ Rosemary (Rosmarinus officinalis) with its upright habit and somewhat twisted branches reaching for the sky (height typically 4-6 ft and more, especially ‘Blue Spires’). I use its stems for bouquets and the leaves for cooking; even the fragrant flowers are edible. As with many popular plants, there are too many cultivars and hybrids available to mention here. Of great importance are the prostrate ground-hugging kinds whose heights range from 1 ft to 6 ft or more that are often used in erosion control or as groundcovers. The toughness of Rosemary is admirable: It’s tolerant of moderate watering, sea-side conditions and blistering sun; I think it’s a must-have in the Mediterranean garden. Although it can take alkaline soil if given a moderate feeding from time to time, good drainage is essential; you can lighten heavy soil with plenty of organic matter. Their cold-hardiness varies depending on selection. All of these specimens are excellent examples of low water-use, low maintenance, beneficial plants that I love to use in water-wise landscape designs; I think they belong to the category of plants that are indispensible when the design wants to be ‘sustainable’, and with these attributes and their famous fragrance who could resist? I never thought I would have to come to the defense of trees in the landscape. One of the most perplexing moments in my profession happens when a client says that they don’t want trees in their garden. Upon my rather baffled question why, their response is usually “too much water use”, “too much maintenance”, “not needed” or “just too much trouble”. Hearing this makes me cringe, but I imagine what might have caused their feelings: High maintenance (such as pine needles in their pool filter), nuisance (like olive stains on the pavement), or danger (such as a branch dropping out of a Eucalyptus tree). With these images in mind, trees are for them undesirable members of the plant family that they don’t want in their garden, and they don’t share the notion that “trees are deeply rooted into the human psyche; in a hectic and chaotic world, greenery provides you with a safe, nourishing haven”. (Fran Lambert, Consulting Arborist, in “Trees and Turf”, April 2006). I am passionate about good design as well as about plants, so remaining calm in this situation and not becoming “preachy” is a challenge. The role of trees in the landscape seems uncontested, but when you think about them, what comes to your mind besides beauty, shade, stature? For me as landscape designer, I am foremost interested in the architectural aspects of trees. First of all, their size and mass establish the overall framework of the spatial composition; in this way, they are among the most important landscape design elements, creating floor, walls and ceilings of “outdoor rooms”. A vegetative ceiling can provide a sense of vertical scale in an outdoor space, a feeling of comfort and shade. Trees give a house scale and place it in proportion with its surrounding; a house without trees therefore feels like a box that isn’t grounded, like a container that hasn’t settled into its site. Trees can act as windbreaks or screen of an unsightly view, or frame an attractive one like a picture frame. With their color and structure, they can be used as an accent point in your landscape picture. Besides being indispensable parts of a design, trees play a great role in human as well as the environment’s health: Their canopies contribute to air quality by filtering dust; they also provide some noise reduction (the tall, densely planted trees with fleshy broad leaves do the best job). And, as a tree provides nesting and shelter for birds, they assist in insect control, and listening to the song of birds is usually very pleasant. As energy consumer I consider also the energy savings through trees, and last but not last SHADE! “It never rains in California”, and the whole world envies us for it, but to have endless sunshine in a garden would be like living on a sunny plaza that has no shelter from the sun. A man-made shade structure can be a great element in a landscape, but it doesn’t quite have the same effect as the dappled, cool and moist shade of a tree! Summer shade from the deciduous trees placed on either south or west sides can lower utility cost by amazing 10-15% (and allow for solar heating in the winter months). These are measurable benefits that we gain from trees (not to mention the delight that a tree in full bloom can create). And the cost of trees, you may ask? Of course, there is some maintenance: A young tree will benefit from yearly inspections and minor corrective pruning during its infancy to assist it in growing into a well-shaped healthy specimen; this way a costly restorative pruning can be avoided when the tree is much older. And water needs? Of course you will need to water your trees; even trees indigenous to our dry Southern California need water during their establishment phase which can last a couple to 3 years depending on the amount of rain during the winter months and other factors influencing establishment. Weighing the investment in trees against their benefits, consider this: The National Arbor Day Foundation states that “A well placed and properly irrigated tree will have a measurable return on investment”: In deed, the Foundation estimates the value that trees add to properties at 15-20%! And don’t plant trees too close to power lines, nor closer than 10 ft to permanent structures. (Check also on proper guide lines for tree planting in fire-prone areas). There are great resources in our County for people that want to learn more about trees: The book “Ornamental Trees for Mediterranean Climates; the trees of San Diego” is a colorful guide and compendium of a host of trees that thrive here, with descriptions, photos, and even addresses where the photos were taken. 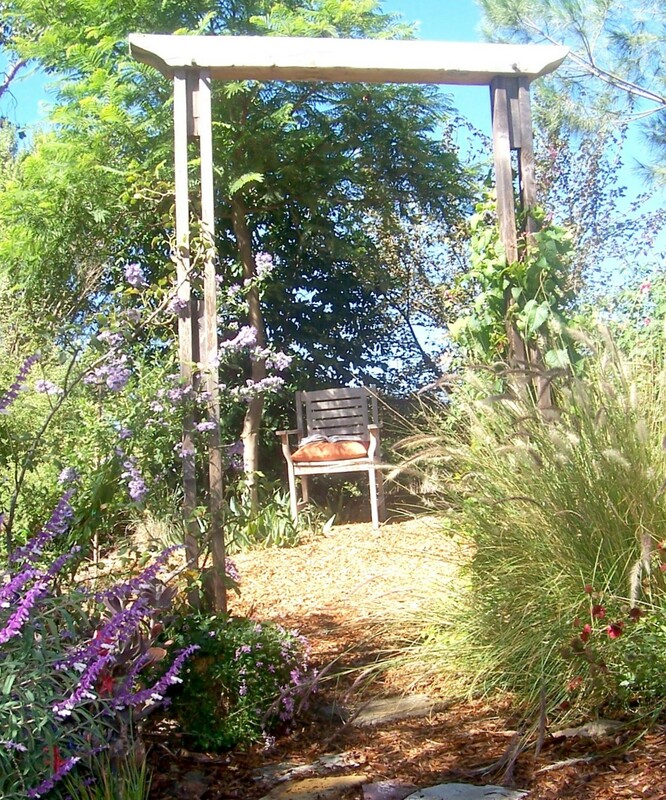 The Water Conservation Garden in El Cajon (more info at www.thegarden.org ) showcases many suitable and lovely trees for our area. And of course there is Balboa Park with its trees, and the San Diego Botanic Garden (formerly Quail Gardens at www.qbgardens.com ). I don’t think I’ll ever be detached and impartial when it comes to trees, but armed with the above list of arguments and paybacks I hope to be more neutral and professional when explaining how trees will benefit my clients and how fundamental (could you say imperative?) they are for their home landscape. Despite of their initial rejection none of my clients has yet refused to concede interest in trees, and fortunately, I haven’t yet had the commission to design a “tree-free” garden. That would be the saddest thing, and I hope it will never happen. I have a special predilection for the color Red: Not only does it become me as a blonde, it also fires up my mood, makes me cheerful and revs up my energy. I am drawn to Red like a hummingbird, and if Red on me invigorates me, I believe seeing red “lights” in the garden would do the same. Even in a garden space where the main hues are cooler and more restraint, and where there are lots of calmer tones in rocks, timber, pathways and other hardscape elements, a few red splashes warm up the planting scheme and make the tones more saturated. Red works particularly well in South-West style gardens, where it makes a lively contrast to lighter colors such as DG, sand or gravel whose tones look washed out in the strong sunlight; used as color on a background wall it adds drama to succulents and cacti. Red can provide a bright focal point, such as a Bloodred Trumpet Vine Distictis buccinatoria drooping from a wall or from an arbor, or a Crown-of-Thorns Euphorbia milii, mixed with Firecracker Broom Russelia equisitiformis, spilling from an urn. Used as accent plant in the background, such as in groupings of red-flowering Aloe behind shorter, softer perennials or clumping succulents, the Aloe’s red flower spikes will show like exclamation points, and their pointy leaves will create a dynamic contrast in structure and texture. When planted in the foreground as border accent, or hugging the curves of a path, Red creates a bright ribbon through the garden that your eye can follow; as foreground plant repeated throughout the garden it ties different areas together and adds cohesion. If used as red winter bloomer, f.e. Cyclamen Cyclamen persicum, it will bring much needed warmth into your planter beds, and in dark and shady places the red flowers will shine like lights. I am having fun doing this and have compiled lists of plants with red flowers that I like to use. Of course each landscape prompts a different choice because of its design style, its existing sun/shade conditions, its soil type, the character of the architecture and the hardscape materials chosen. The following compilation of “Reds” contains plants with various growing conditions, but all are long-lived, low in maintenance needs and more or less water-wise and tolerant of xeric conditions. (However, it’s important to note that a plant’s location will determine how tolerant of dry conditions it is: For example, a Crangrape Cuphea C. llavea “Crangrape” is more drought tolerant in coastal locations and soils than in hotter inland valleys.) Nor is the list all-inclusive, and if you have more suggestions, I will be happy to add them. Coral Trees Erythrina x bidwillii, E. caffra, E. coralloides etc.